Ugh! It’s that time of year again. Time to stop overlooking all the sand, crumbs, and unidentified little objects that have collected in the car after a summer of tramping from one summer activity to another. 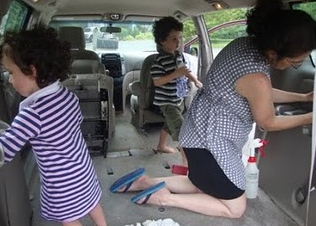 Time to give the kids another lesson in practical life as our family not only did, but fully memorialized with a write-up and photos in the Montessori-Inspired Car Wash we shared on our family blog Training Happy Hearts. And, if I look at the Quarterly Task list that I made sometimes between my first and second child, I see it is also time for some other seasonal jobs. Yep, the Pre-Mom-of-Three-Me somehow had visions of being an organized Gardener, Homemaker, and Hostess. She even wrote out a checklist help herself along. □ Remove any planted hyacinth and tulip bulbs and keep in cool place to plant next fall. □ Deadhead spent blooms by pinching them off, unless you want to leave them for the birds to feast on. □ Begin a new “lasagna garden” or add another layer of compost to existing ones. □ Check washing machine hoses and replace if necessary. □ Clean out and organize garage. □ Clean clothes dryer vent. Check the flapper door on the outside vent and remove any lint buildup with a vacuum. If vent is flexible, check for kinks and patch small holes with duct tape. □ Caulk all joints and cracks around doors and windows if needed. □ Move large appliances and clean beneath them with a vacuum. □ Put peel-and-apply weather stripping around windows and doors to reduce air leakage and cut utility bills for colder months. □ Pressure wash driveway, sidewalks and walkways, if needed. □ Pressure wash house exterior, if needed. □ Pressure wash and re-seal deck, if needed. □ Unscrew aerator from end of each outdoor faucet, wash them and replace if necessary. □ Check shutters and deck painting and repaint if needed. □ Clean window screens from the outside with a hose and stiff brush. □ Practice emergency evacuation drill. □ Order a credit report. □ Have a good-weather outdoor get-together with friends and family. Funny, huh? I don’t think I ever did most of the things on the list and I know I will certainly only do a handful of them this shoulder season. I also have a feeling that one day distractible-me might busy herself feeling productive by revising this list instead of actually getting to any of the line items on it. But, maybe, just maybe, I will listen to what the Old Me suggested. Perhaps I will motivate to make at least make a baby step towards reconciling the ideal with the real in my home, in my garden and on my social calendar. How about you? Do you have any seasonal chores you know should be done or could be done if only you had a bit more time, motivation or help? Do you have a routine in place for keeping up with home maintenance? Are you better than me at actually making seasonal to-do’s was done’s. Wow that’s an ambitious list! Mine is more like “vacuum and dust” seasonally. Kidding of course! This year I’m determined to rid my closets of clothing that has not been worn in over a year. I have way more than I have space for and it’s time for it to go! Good luck on your clothing sort. It’s always a tough job, but so rewarding. I thought of your list today when I had the misfortune to be at a vantage point where I could see my gutters…..and the debris in them. I’m going to try really, really hard to get that task done this fall.